In a business world where continuous change is inevitable, competitive organizations understand the value of quickly adapting to market trends can be the difference between keeping one’s head above water and leading the pack in industry innovation. Leading companies are always looking at new ways to improve their processes and seek the latest in process improvement strategies and methodologies to build a more efficient business model and better serve their customers. Whether it’s the family of ISO 9000 Quality Management certifications and Six Sigma methodologies common to the manufacturing world, or the CMMI maturity model often leveraged by software development teams and the OPM3 model employed by project-centric environments, business process improvement strategies have proven time and again to deliver on their promises. However, the challenge with any of these valuable process improvement methodologies lies with their effective deployment. Many organizations, do not recognize that process improvement changes are not strictly operational in nature. These highly impactful initiatives are in fact strategic projects that require careful planning, stakeholder management and change management strategies to ensure their success. Although many organizations initially underestimate the role of project management in their process improvement initiatives, once they have committed to these strategic changes, the implementation of these improvements naturally fall into the hands of a designated project manager to see these initiatives through. This white paper will help organizations identify what to expect when facing the delivery of business process improvement projects and the challenges of dealing with extensive change resulting from these strategic initiatives. Moreover, it will also explore the OPM3 project management process improvement methodology and the role of change management that can impact the overall success of process improvement delivery. The first step in moving forward with any new process improvement initiative is to properly plan all the moving parts of this strategic project. More than any other project, process improvement will greatly impact all those who are currently linked to the work in which these improvements will touch. This being the case, preparing all the relevant stakeholders and leveraging their past experiences when building the project plan will allow for a smoother transition to occur. Whether you are implementing a Quality Control process or a Maturity Model, plotting the steps to move from the “old way of working” to the “new way of working” is a critical project that requires a timeline, milestones, deliverables and documentation that needs to be shared with a formal project team. Treating the process improvement initiative as a project will formalize the process change and will ensure the new process improvement will be delivered in a timely manner. Project Kick Off – The team and stakeholders are assembled to discuss the launching of the initiative, timelines and any outstanding questions that need to be addressed. Indentifying the process improvement need – Tasks are assigned for documenting the current process. Intensive collaboration is needed between the project lead and those currently involved in executing the work for the process in question. Analysis of current process in question – Following documentation of the current process, a carefully selected team of internal and if necessary external subject matter experts provide analysis and shortcomings of the process that is slated for improvement. Redesign of business process – Proposed redesign or existing best practice process improvement methodology is documented and aligned with the corporate goals. Pilot of improved process – The improved process is deployed to a pilot group for testing and tweaking to ensure process alignment is achieved. In parallel, a change management strategy is defined to ensure a successful pilot and future roll out. Present process improvement to stakeholders – the results of the pilot are presented and evaluated by the stakeholders of the project. This is where final buy-in to the improved process occurs and roll out is approved. Roll out of improved process – Actual roll out of improved process or methodology takes place fully implemented in the organization. The tested change management strategy occurs in parallel to ensure the project’s success. Measure and evaluate its success – This final phase occurs at various milestones in the future to ensure the implemented process improvement has successful results and/or requires modification due to changing goals or needs. It is critical that process improvement projects are consistently headed by a project lead so that potential arising issues in the future can be quickly addressed and that both stakeholders and those part of the new process can centrally communicate feedback. As any organization will confirm, a successful process improvement project is an ongoing initiative that requires knowledge transfer and tracking in order to reach the goals set forth by the improved process. organization’s project management practice and/or team are intricately linked to the success of any process improvement initiative. Hence, poor project delivery will ultimately lead to poor process improvement results. 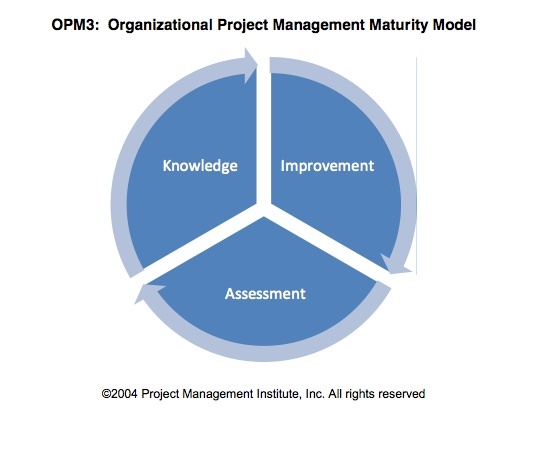 In light of this reality, PMI’s Organizational Management Maturity Model (OPM3) is one of those few process improvement frameworks that can impact all process improvement projects. 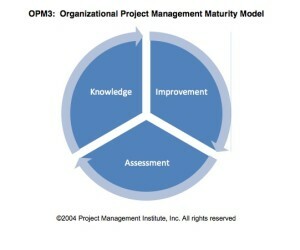 By identifying first the maturity of your project management practice and then providing practical process improvement strategies to this area of business, OPM3 will not only help deliver successful projects but will also provide program and portfolio management strategies and best practices to ensure you prioritize and implement the most valuable process improvement initiatives. Knowledge – allowing organizations to access hundreds of Best Practices to improve their project management practice. Assessment – tools and a methodology that allows for self evaluation and the identification of areas of improvement to reach a higher level of project management maturity. Improvement – framework and road map for process improvement to achieve defined goals. For those going down the process improvement path, OPM3 and other project management frameworks can lay down the foundation in building better processes for the overall organization. After all, the delivery of process improvements projects is equally as important as the improved processes themselves. In addition to successful project delivery, establishing a change management strategy as part of your process improvement project is an area that cannot be ignored. Process improvement needs to move beyond the motions of changing the way your organization works and requires a strategy that will ensure that the people responsible for executing the new changes are on board. Consequently, both resistance to change and organizational roadblocks need to be addressed so that the process improvement project will fully integrate into the organization’s business operations and culture. A key component into effectively managing change requires a deep understanding of the primary stakeholder responsible for the process improvement’s success. Typically the natural urge to resist the “New” can cause the most problems with the transition taking place. With this reality looming, it is key for the primary drivers of the process improvement initiative to align and promote the positive benefits of the new processes delivered to the organization. In the end, the goal is to effectively communicate and prepare the alignment of the positive impact resulting from the new and improved business processes in relation to the everyday challenges faced by those inheriting these new changes. Genius Project’s unique role-based workflow engine can manage any kind of process from the most simple to the most complex. This can include parallel revision and approval, conditional transition of information and the automatic creation of data and documents. In addition, Genius Project can incorporate the desired flow cycles, gates and typical phase reviews and approvals that meet your organizational requirements. Collaboration is a form of professional or social cooperation among individuals, groups or firms where they team up for fulfillment of a common goal for a variety of reasons. There can be various others involved depending on the collaborators expertise, tastes, objectives and other issues involved. Why has collaboration become so important nowadays? With the information technology coming of age, people across the world can share, communicate and coordinate on common issues without any checks or controls enforced by an authority. This helps people to share their areas of interest and invent something new. An Online Collaboration Toolcan be of great help in such type of interactions. Various business groups, industrial firms collaborate to produce something new in terms of a product, marketing strategy, processes, brands and others. They work on a common project which has a predefined objective. How do they manage to accomplish a project in collaboration. They form teams, sub-teams and employ members who have a clear-cut responsibility for a particular task and who can communicate amongst themselves. This type of project management is less centralized and more collective where all members can control, provide suggestions and get enforced the task. This type of setup helps to avoid bureaucratic hurdles and remain focused with clarity of goals and their timely achievement. In order to communicate, they must be comfortable in using modern tools of communication employed in information technology like emails, social media, project management systems and others so that communication remains open ended and error free. This is important as the team members involved may be dispersed in different geographical locations across the world and they must remain in touch with each other easily for professional reasons. There have been active collaborations in the field of medicine, science, research, education, corporate and others and there is hardly any field which is untouched by this. More and more teams are working remotely nowadays. This is quite beneficial for businesses as it allows them to save considerable time and costs. But maintaining effective communication and collaboration among globally dispersed team members remains a big challenge. Geographical distances separating them can hamper communication and collaboration among them. This in turn can drastically affect their efficiency and productivity over work. But this concern of businesses can be properly addressed by using online collaboration softwares which enable fast and accurate communication among team members in a convenient manner. So this provides a great scope for businesses who have some great ideas and plans and want to work towards their success. This would help them to grow and profit more. So we are providing here a list of five useful online collaboration softwares that will not only facilitate effortless communication and collaboration among remotely located team members, but will also enable them to work in a collaborative, efficient and productive manner. With better bonding among them, their efforts will be translated into quality and timely results which every business needs for its success. 1. Skype: This online collaboration application enables instant and convenient communication between people both at work and at personal level. The beauty of this tool lies in the fact that it can be accessed from variety of devices like mobile, tablet, computer, home phone and even TV. Users can make voice and video calls, send messages as well as share files, videos and photos. A boss can easily and clearly explain finer points to his remotely located team members through a video call. Its Group video call feature allows users to communicate with up to 10 people at the same time. You can enjoy some great moments with your friends and family members through its video chat feature and see them right before your eyes even if they are distantly located. 2. ProofHub: This online project management software enables organized and planned management over projects. It is quite easy to use and offers some pretty useful features like notes, to-do’s, calendar, mobile, Gantt besides others. It enables fast and accurate communication and collaboration among globally dispersed team members. They are able to perform their tasks in a timely and organized manner through to-do’s without forgetting their tasks. Progress over projects can be precisely tracked through its Gantt chart feature and risks can be identified early and resolved promptly. Thus projects can be properly managed within the constraints of time, budget and resources and can be timely and successfully accomplished. 3. Google Drive & Google Docs: Google Docs let you create folders, documents, presentations, spreadsheets besides other things. Users can create files, edit, upload and share them with their co-workers. Google Drive acts as a free online repository where these files, documents and other things can be stored and these can be readily accessed from any location and from different devices. Google Drive imparts users the flexibility to work with various kind of files by installing different Google Drive apps. 4. Evernote: This online application allows users to create notes, view and edit and store them and reference them easily for further use. It enables users to capture content present in variety of forms like photos, web pages, handwritten notes, to-do lists besides others. In customizable notebooks, these notes can be grouped together. Notes can be easily and quickly searched and filtered through tags. Co-workers are able to conveniently share notes with each other and this boosts their efficiency at work. 5. Dropbox: This enterprising tool lets users access their files while online. An individual can readily sync these files to a computer and access them while offline. He can operate these like any other folders and files. Users can access their files and documents from any kind of device whether it is a tablet, phone and computer. It grants them the flexibility to edit documents, add photos and show videos from any place in the world. Their data and information remains secure and safe from any accidents and it can be restored in split seconds. Users can control the access of other individuals to their stored data. It is quite a useful application for storing work related and other kind of data. During the execution of projects, so many challenges and issues may arise which can obstruct their smooth functioning. The sheer number of tasks and activities makes it difficult to track each one of them precisely and execute them in an organized and scheduled manner. So the projects may get delayed or fail. To counter such concerns and to ensure better organization and smooth execution of processes and activities, organizations needs to adopt a better methodology. Web-based project management tools are the aids which will enable perfect organization over projects and tasks besides enhancing communication and collaboration over them, so there are greater chances of projects and plans completing on time and becoming a success. We are providing here some great project management tools that can be banked upon for better management over projects. This would prove to be of great help to those users who are seriously thinking about switching to a project management solution for managing their projects. So go through them, take your time in judging the best one that suits your needs perfectly. 1. Basecamp: This project management software has been the pioneer in the project management field and has been credited with providing a new project management methodology for better management over projects. It has got a rich set of features like projects, discussions, to-dos, dates, text documents, files, dashboard, calendar, etc. It enables team members to better connect, communicate and collaborate over project affairs and they can perform their activities in an organized and prioritized manner. Progress made by various individuals while performing various activities can be easily tracked. Individuals if they happen to be away from their work for a day, can check everything important happening in a project through its catch up option. It is so easy to find any project-related thing. This enterprising tool makes managing projects a simple affair. 2. ProofHub: This enterprising tool facilitates collaboration over work through better planning, organizing and faster delivering of work. Goals can be better defined, ideas can be shared and effective strategies drawn to get best results from team members. It stores all important conservations, designs and documents in a single location which can be quickly referenced. This application is simple and easy to use. Users need not spend time and effort for learning how to use it. Individuals’ work performance gets instantly tracked and assessed. Progress over projects can be monitored precisely, and work can be delivered on time. It offers some very useful features like in-built chat, files and proofing, integration with Google Drive and Dropbox, Gantt charts, discussions, to-dos, notes, calendar and milestones and timesheets for better communication, management and organization over projects and tasks. It also contains some advanced features like casper mode, security and customization for more control, privacy and security. Its enables effortless communication and collaboration among team members who are located in globally remote locations and they can resolve matters in a fast and productive manner. Tasks and activities can be better managed and executed in a timely and planned manner and better tracked. Progress over a project can be minutely and critically tracked through Gantt charts. This tool enables organized execution of projects and leads to their timely and successful completion. 3. Asana: This project management software enhances communication within a team. It stacks conversations around tasks in a single centralized location and enables team members to work collaboratively without the need to communicate through emails. Thus team’s communication better revolves around work. It helps to organize efforts over work. Tasks can be easily created, assigned to members, followed and commented upon which helps to know what is being achieved over work and which members are contributing to it. This helps to reference work-related history from a single place. Its inbox and notifications feature keeps everyone updated on important activities happening even if members are located in different global locations. It can effectively handle wide variety of simple to complex tasks. Tasks’ customized views can be created through search and filtering options through which teammates’ tasks can be better tracked. Milestones get achieved easily through setting of priorities and due dates. It is a great tool for working together in a fast manner. Its versatility enables teams and individuals to work more and qualitatively. It enables effective planning, organizing and tracking over projects and plans. Its clean and intuitive design enables working with ease. It enables real time interaction between team members and is highly adaptable to users’ needs. 4. 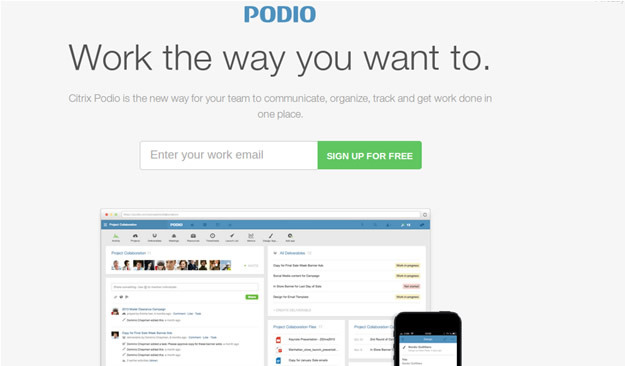 Podio: This tool enables better communication and collaboration among team members who are working together over a project or plan through creation of workspaces featuring Podio apps. Users can create their own workspaces to collaborate and communicate with other group members. Users can build their own apps or they can choose a suitable app from hundreds of already available free apps. These apps remain connected to social and collaborative activity streams which provide commenting and discussion options. Users remain in full control of their work tools. They can build teams, projects and workflows in their own way and as per their needs and share effortlessly with other individuals. Users can create and disseminate work-related content and information. Activities happening in projects can be better tracked through activity stream. It has got some great features like calendar, tasks, contacts, web forms, mobile apps, API, alerts, etc which enable collaboration over work in a single place and enhances productivity. Users need not excessively use emails for communicating. They can effectively share and exchange tasks, activities, files, ideas, updates and information with other team members, clients and customers. It is a great tool for work-related communication and collaboration. 5. 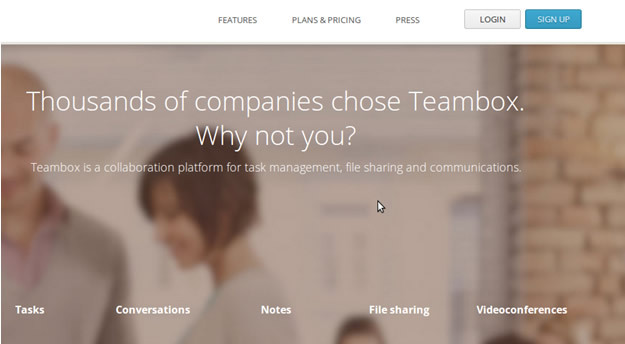 Teambox: This utilitarian tool enables enhanced communication and collaboration, better task management and easy file sharing among team members over work. It is quite easy to use. It has many useful features like conversations, tasks, time tracking, file sharing, notes and video conferencing. Apart from these, it provides a wide variety of collaboration applications for better collaboration within a team. It boosts team productivity through better planning and coordination over tasks. Updates are made readily available to members regarding the status of various tasks and activities. Projects and teams can be better organized and members’ performance can be properly tracked making them more accountable. Tasks can be easily created and better managed. Progress over tasks and milestones can be better viewed and assessed through workload view, milestone calendar and Gantt charts. Files and content can be better managed, shared, searched and worked upon. Communication among members gets organized and they can work with more focus. Features like video conferencing, screen sharing and group chat enable better connectivity and communication among globally dispersed members. It also provides mobile apps through which users can better connect with those clients and customers who operate through phone and tablet. It is available in 8 different languages of the world. This application has been made secure through standard encryption mechanism. It also offers other utilitarian features like wiki-style pages, customization, API and integration with Google Docs and Google Calendar, etc. Members can better collaborate over work through this productivity enhancing tool. 6. 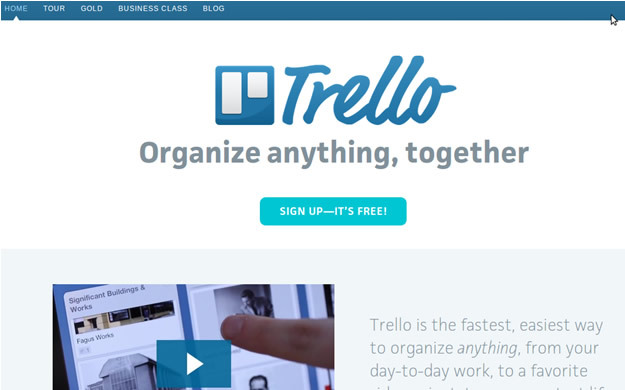 Trello: This project management software organizes plans, projects and work. It facilitates effortless collaboration among a group’s members and they can be promptly invited over a matter for addressing it fast. All members remain updated about various activities happening in projects, so everybody is clear about each other’s role. It can be easily adapted to perform a variety of tasks such as planning over a task, creating informative bulletins around various events, etc. Projects can be better managed and their activities can be precisely and minutely tracked. It operates through cards which can be used to write upon important information, present ideas or mention tasks lists. Its checklist feature helps to highlight and document to-dos, so things can be performed at the right time without forgetting. Tasks’ progress can be tracked precisely through a progress meter. Deadlines over tasks never get missed. Once a task approaches its deadline, the card’s front portion will turn yellow as a reminder. There is effective file management. All members can add charts, make changes and upload files and documents if needed. Members are kept updated over activities through email notifications and activity log. Opinions of various members over a matter can be gathered through their votes on cards. This helps to know what are their priorities. This facilitates better decision making keeping in mind their unique views and ideas. Tasks can be better assigned through cards. If a board, card or list gets deleted by accident, it can be easily recovered. Information is properly backed up and kept safe from any accidents. There is controlled access to the data. Boards can be accessed even on the go. It magnificently improves work related collaboration. 7. Projecturf: This utilitarian tool enables collaboration over projects and tasks in an easy manner. It not only looks beautiful, but also offers a great functionality. Team members can work efficiently and quickly with more focus. It organizes and stacks data in a single place. Instant email notifications keep everyone updated over projects and tasks. It enables completion of projects on time and within budget. Members have an all time accessibility to projects. It provides multiple workspaces in one login. It drastically reduces reliance on the email. It enables precise tracking of what is in the pipeline, what is delayed and what is due for today. Comments can be quickly added. The sidebar feature enables easy viewing of tasks, conservations and tickets in a clutterless manner. This tool is well integrated with Dropbox and Google which allows smooth sharing of files from these applications. It enables better organization and planning over tasks and projects. It contains a variety of useful features like reports, subtasks, ticketing, search, conversations, Gantt charts, time tracking, data filtering besides others. It offers a great number of built-in apps which enables greater collaboration and enhance productivity. Activity, dates or people can be easily filtered. Progress over project tasks can be easily and precisely tracked giving one a full control over a project. Tasks can be easily and fastly created. It also provides calendar for better event management and tickets for effective bug management. Clients can be accurately billed through precise time tracking. Its notes feature enables creation of text documents that contain great information. Contacts can be easily created and managed. Reports can be easily prepared to get more input over variety of information. A great tool for collaboration over work and projects. 8. 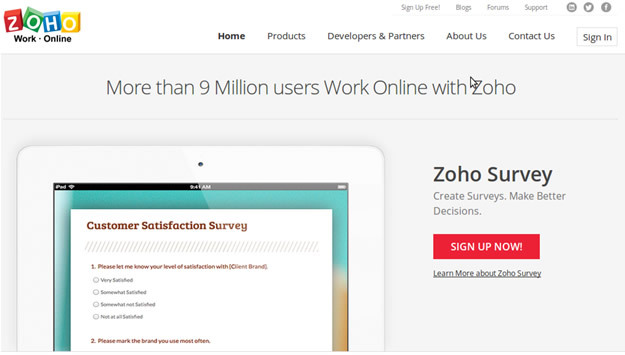 Zoho: This tool classifies applications into three categories namely collaboration, business and productivity applications. In its business apps segment, there are a variety of features like assist, campaigns, bug tracker, contact manager, CRM, invoice, recruit, report, etc. While assist enables easy and instant connectivity to remote computers besides offering effective support, the bug tracker enables identification, tracking and fixation of bugs in the programmed code. Similarly campaigns feature is used to reach out to customers and involve them for meeting business objectives. In its collaboration apps section, it contains features like chat, meeting, projects, pulse, etc. While the chat facilitates quick decision making in a group scenario and faster discussions in a real time setting, meeting enables conduction of online meetings with any important individual who might be based in any part of the world. Its project feature enables effective management over multiple projects and their activities can be tracked properly which leads to their successful and timely completion whereas pulse happens to be the social network for an organization. In its productivity apps segment, it contains features like calendar, notebook, writer, etc. The calendar features allows easy and effective scheduling of meetings and ensures their proper management and timely conduction. Information can be easily gathered and collaborated upon through notebook. Documents can be easily created while being online through its writer feature. This collaboration tool enables users to better manage their business process and information so they can achieve more productivity while they work from their office or while being on the move. These enterprising tools have the potential to transform working of organizations and businesses. They can streamline their processes and tasks which will make them more productive and they can extend timely services and products to their clients and customers. This boosts their marketability and enhances their profitability. Users can go through these tools and critically examine them, so they can choose the best as per their needs and interests. It would take time and effort and incur costs, but would give them better control over their work and pave way for a grand future. We wish them best of luck and a very Happy New Year. For those who have not used PA in the past, there is a 30 day fully featured trial version available. If you decide to buy, a single user license only costs Australian $50 which is about US$44. Project Administrator manages issues, risks, actions, meetings, schedules, roles and responsibilities, budget and expenditure, checklists, timesheets, diary notes and even a glossary.